View recent Online Memorials created by loving Pet Owners. Show that your thoughts are with them by lighting a candle. Create A Free personal Online tribute to your pet. Design Your Own REAL Slate Memorial and have it shipped to your door. Saying goodbye to a loved one is never easy. When that loved one is a treasured pet, the loss is no less real. We’re here to help you immortalise the beautiful memories you have of your pet. We understand that you’re not just looking for a product or an ornamental piece. Your memorial is your connection to your departed pet and has a value far beyond any price tag. It’s because of this that we take such care over every item we produce. Whichever option you choose, we will ensure that your finished memorial is as good as it can possibly be. Any pictures you supply will not just be copied – They will be professionally edited, enhanced, and reproduced onto your memorial. This can include Colour and Brightness Correction, Red-Eye Removal, Background Fading/Changes, and even Restoration in some cases. 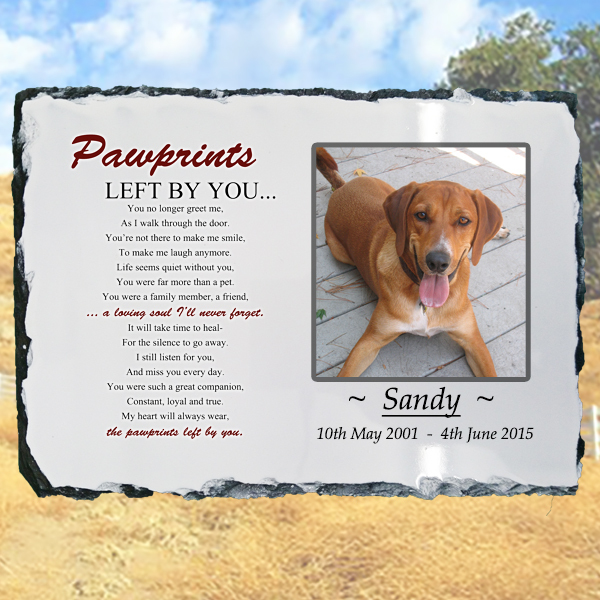 At Pets Held Dear – You can create your own FREE Virtual/Online Pet Memorial and share it with friends. They can leave messages on your page and light a candle. 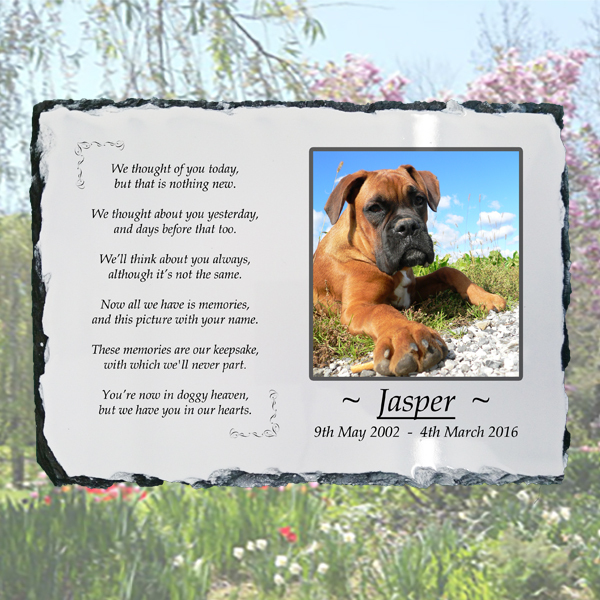 In addition to this we have a unique design studio that’s simple to use and allows you to create your very own custom Slate Pet Memorial Stone/Plaque. You can choose different backgrounds, Poems, and add your own words and pictures. But it doesn’t stop there. Once we receive your design we’ll then professionally edit your pictures to ensure they are as good as they can be (unless you ask us not to). We’re very careful in our editing process to ensure that we never take away from the natural look of your photo. We believe that subtlety is key. In short – We’ll do everything we can to make sure that your memorial is a not only a beautiful tribute to your pet, but that it triggers your fondest memories every time you see it. When you use our step-by-step Memorial Designer, you can easily create your own stunning memorial. You can choose from a selection of beautiful backgrounds, poems, and verses. Some of these are well-known (such as the “Paw Prints” poem), others have been specifically crafted by us and are not available anywhere else. Every order received goes through a thorough design process. Unless you ask us not to – Your design will be carefully reviewed and professionally edited to enhance it in the best way possible. There’s no blanket approach and we don’t apply the same edits to every photo. Each one is completed on an individual basis. This helps to ensure that you receive a stunning memorial you will treasure forever. Only once we are 100% percent satisfied that we bought out the best in your photo will we move on to the actual production stage. In every case we will always reproduce your picture in the highest quality possible. This can include all kinds of improvements from correcting colour and brightness through to photo restoration. However, in this digital world of photo-sharing there are things you can do to help. Most cameras and smartphones are capable of taking high quality pictures. But it’s important to understand that when you share your photos either via text message/email or on sites such as Facebook and Twitter, your picture is “compressed” – The quality is reduced. Where possible, please always use the original photo for your memorial to ensure the highest quality. We’d also ask you to watch the instructional video shown at the top of the online designer. "Our service and products are here to achieve just one thing - Help you to preserve the wonderful memories you have of your pet..."